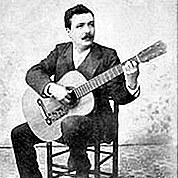 Taken from Methodo Para Guitarra- Aires Andaluces (Flamenco). Etude. 39 Measures. 3 Page. Time Signature 3/4. Key of E minor.